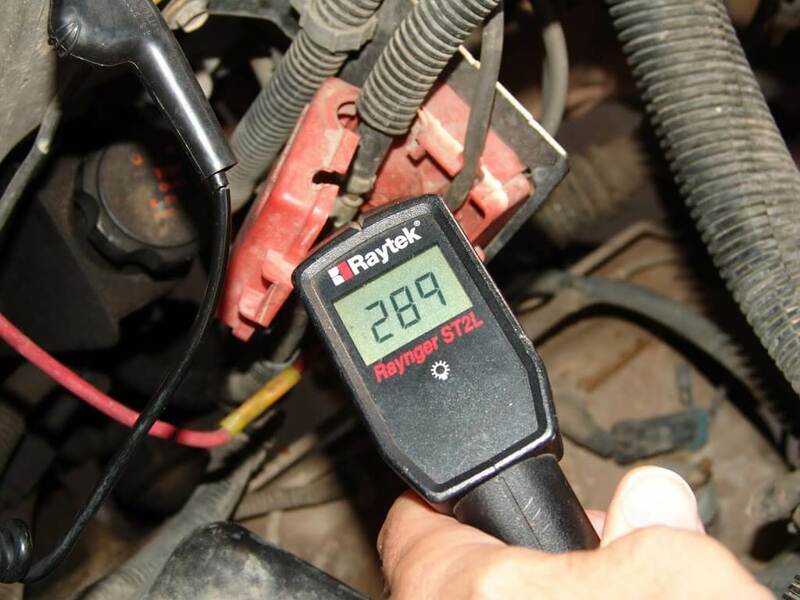 This 2002 GMC Sierra came in with the complaint that the battery had gone dead and that the voltmeter was reading low voltage at times. I opened the hood and the problem was quite evident to me but I decided to do some testing anyways. 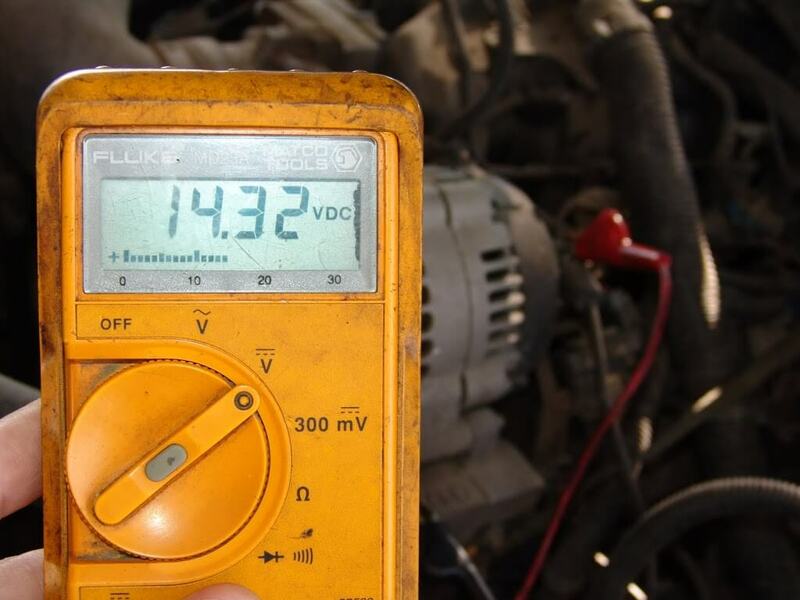 The following picture shows 14.32 volts at the alternator output stud. Engine running of course. This is the obvious problem. A poor connection at the positive battery cable jump point. Someone had wired in an electric cooling fan system and taken the mechanical fan assembly off. While testing, I decided to check the temperature of the connection. The connection, as you can see was at 289 degrees F. The vehicle had only been running about 2 to 4 minutes at this time. 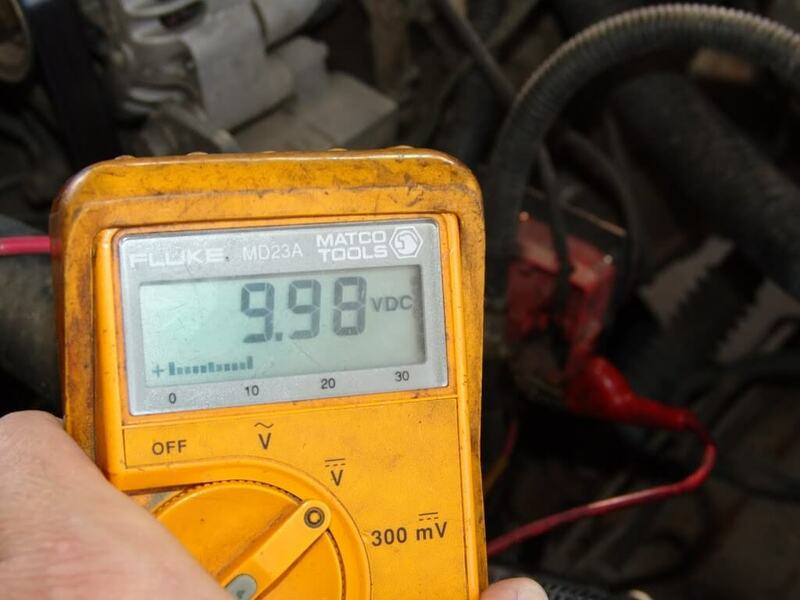 The voltage was only 9.98 volts. 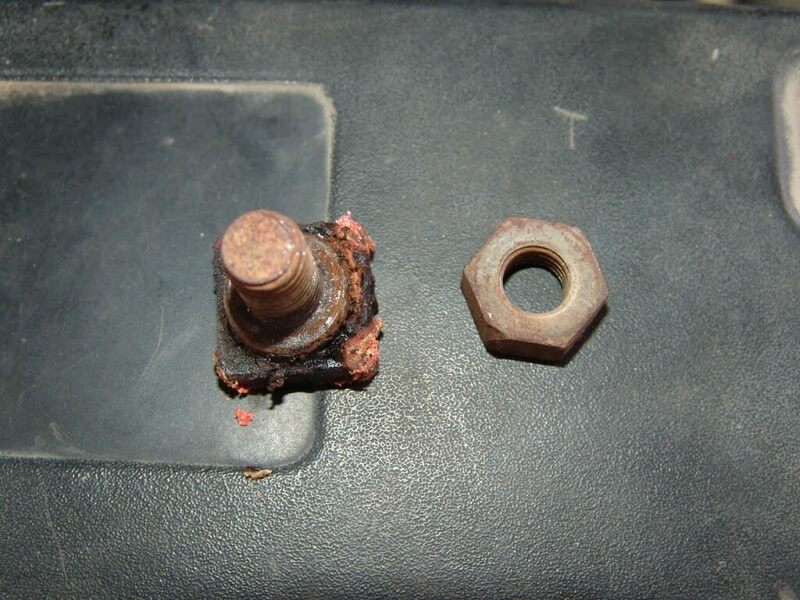 The stud had melted loose of the insulating block assembly. And there is the actual reason for all of this mess. Bare wire twisted around the stud with no terminal. On top of that the curve of the wire is even wrong for household wiring. See how the wire is hooked CCW. At bare minimum it should have been on there in a CW direction so that the loop would have tightened as the nut wast tightened. Didn’t we all learn that in high school electricity / science classes. The plastic in the insulating block was badly melted however the cable eye terminal was just a little dirty. A quick cleaning and it was good as new. 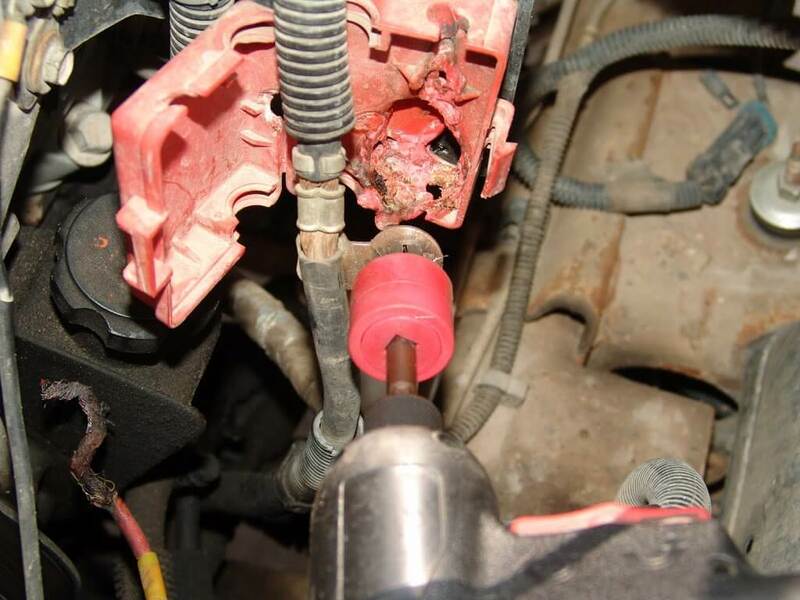 I checked locally, the fusible link from the alternator and the insulating block both had to be ordered. So I continued cleaning up the mess. There sure has been a lot of heat on that stud. At least 289 degrees F, right. I surely do love having a glass bead cabinet. I cleaned and tightened all of the connectors and epoxied the insulating block. The system is now operating properly and I will install the new parts when they arrive. 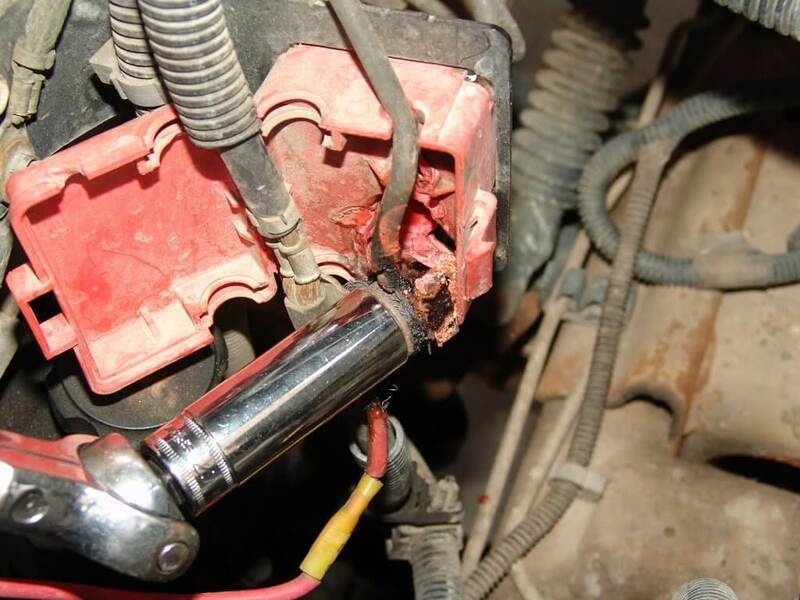 To see how to properly install a fused circuit on this and similar trucks please click here. It is not safe to leave the stud unsecured and uninsulated. The GM number on the red block is 12191376. Only available from the dealership. The numbers for the fusible link are GM 15321209, ACDelco 8XX11FS. You can always try a salvage yard. I keep one of each in stock in my shop because they always have to be ordered. Thanks Sparky! I was able to go out and check the wire to the starter and looks good other being dirty. I’ll check it from time to time (along with the other wires on the stud) to make sure nothing else goes on. Do you know where I might be able to find a replacement red box? The back is completely melted out. Or is it sfafe to leave that connection open? 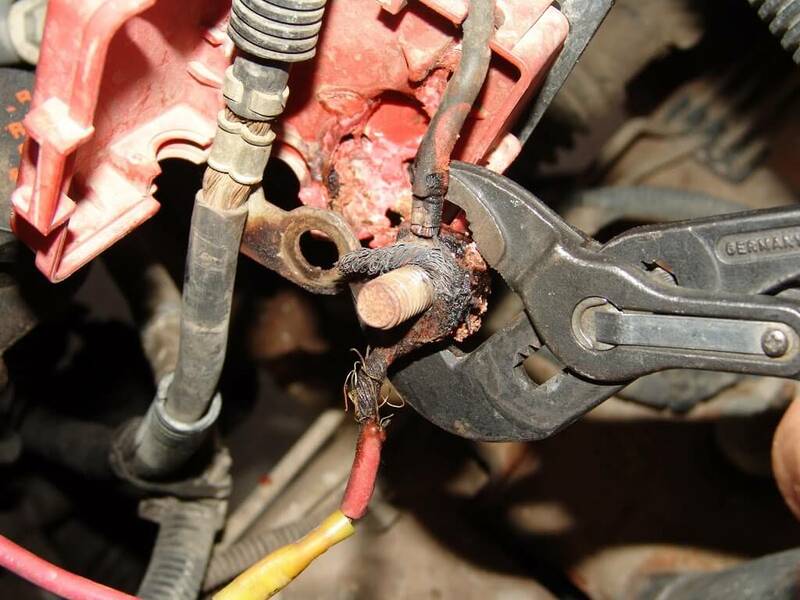 Only positive wiring should be connected to the stud in the red box. Anything else and you will have a fire. 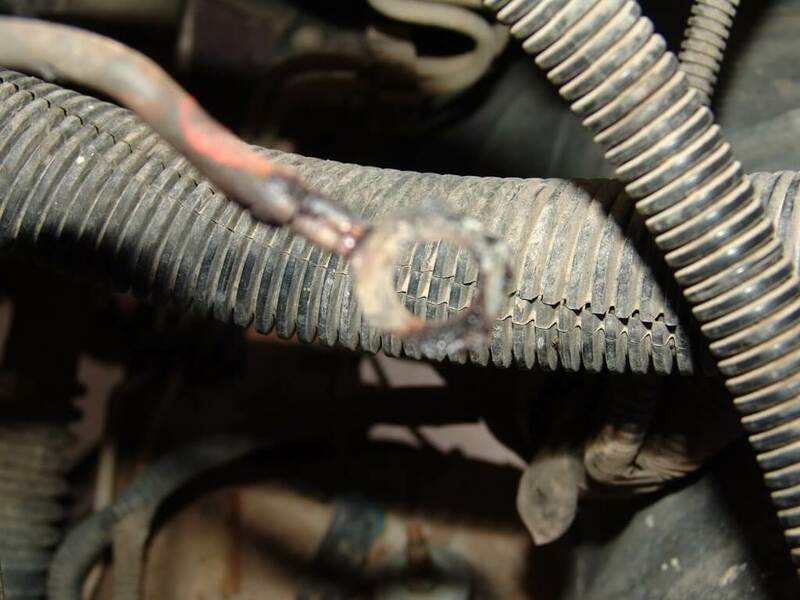 You need to check the cable that goes down to the starter to make sure that it is not shorted or melted anywhere. If that is okay I would suspect one of two things happened. 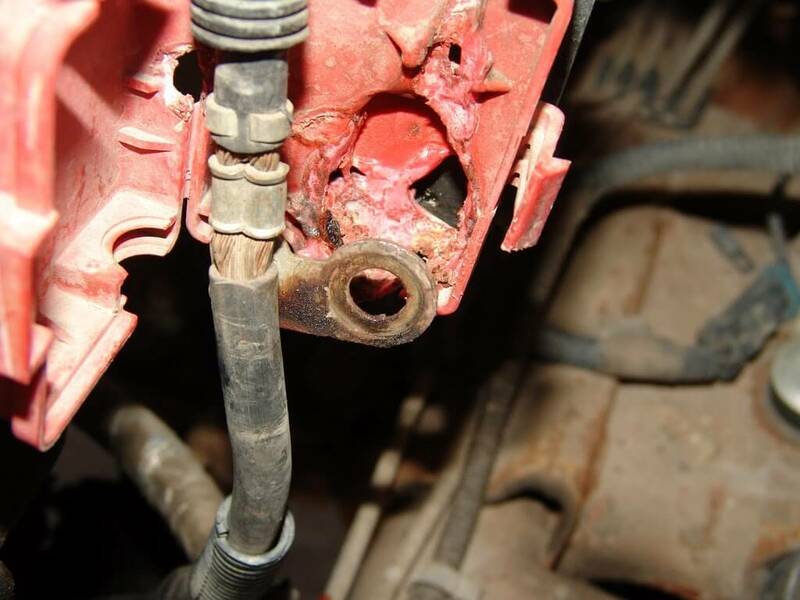 There was a loose connection at the stud in the red box (like the one on the article) or there was a short inside the alternator. I just had this happen on my 2001 Chevy Silverado. 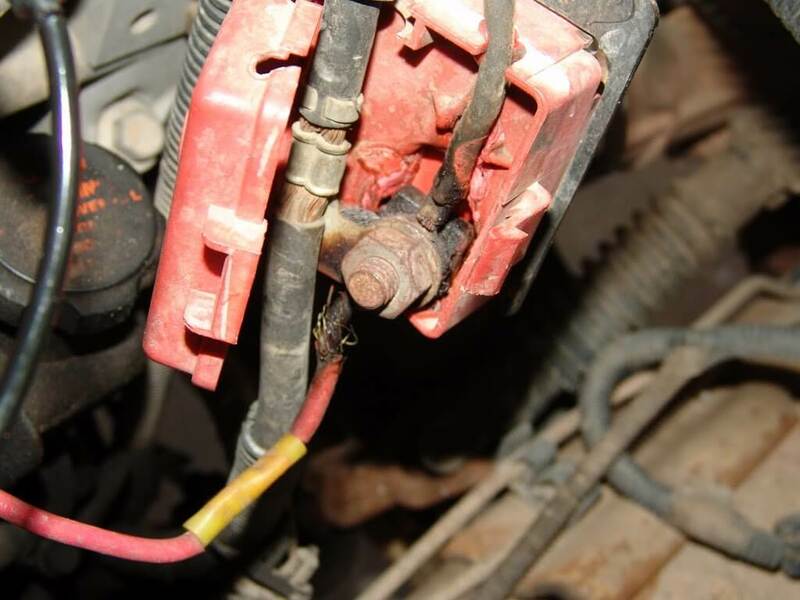 The cable that runs from the back of the alternator and connects to the positive cable at the reb box seen in your photo (I think it’s called a fusible link) was completely melted and the connector and red box had almost dissolved. Whatever caused it killed the alternator. 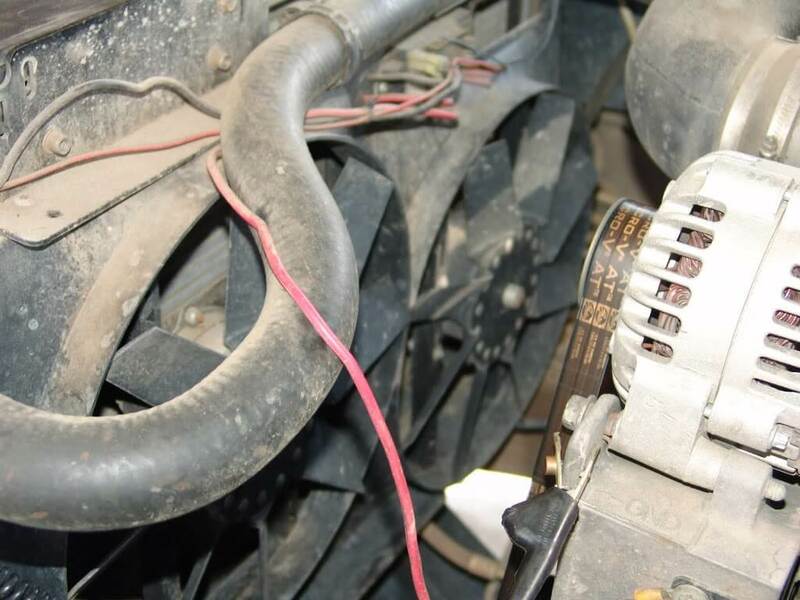 I replaced the alternator and made a new cable to go from the post on the alternator to the positive cable. 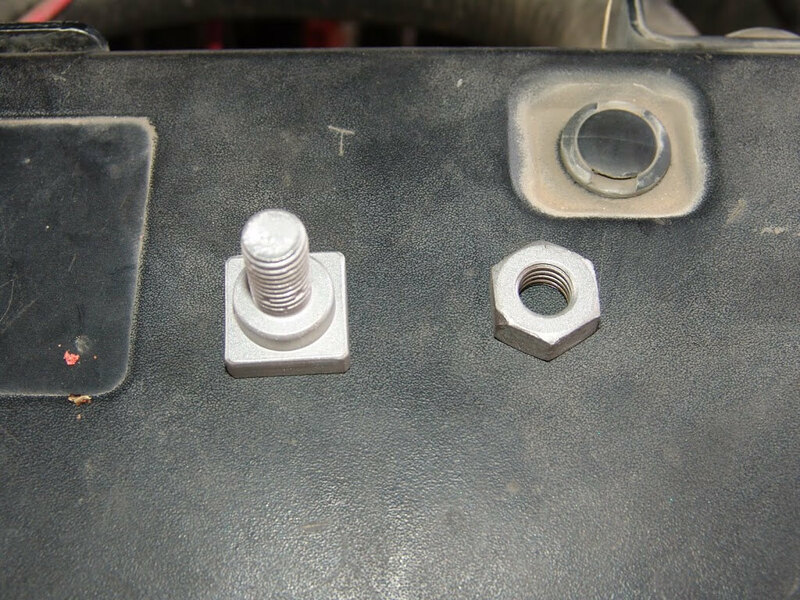 A mechanic told me that the bolt/post that everything connects to should have be grounded by connecting a wire from the metal bracket that holds the red box to the post that the positive cable and fusible link. Is this right? Do you know where I can get a replacement red box?